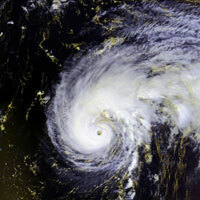 Tropical storm Felix has strengthened into a Category 5 hurricane, the highest level of danger. Felix continues to move through the Caribbean Sea toward Central America. Weather forecasters say that the new hurricane is likely to bring catastrophic consequences if it hits land. Felix was packing winds of up to 265 kph (165 mph) as it headed west, according to the U.S. National Hurricane Center. It was projected to skirt Honduras' coastline on Tuesday before slamming into Belize on Wednesday. At 2 a.m. EDT (0600 GMT) Monday, Felix was centered about 475 kilometers (295 miles) south-southeast of Kingston, Jamaica, and 895 kilometers (555 miles) east of Cabo Gracias a Dios on the Nicaragua-Honduras border. It was heading west at about 33 kph (24 mph), the hurricane center said. At 2 a.m. EDT (0600 GMT), Henriette was 225 kilometers (140 miles) southwest of Cabo Corrientes, Mexico and 420 kilometers (260 miles) south-southeast of the southern tip of Baja California. Its maximum sustained winds were near 113 kph (70 mph). It was moving northwest at 13 kph (8 mph).